Arizona! I was so happy to see it. And to finally see the afternoon temps hitting the 80’s. I chose Benson, a town just off Interstate 10 an hour from New Mexico, because it was central to several things I wanted to see. But also because they had a steal at the Saguaro RV Park for first time visitors, $50 plus electricity for 7 nights. After paying less than $20 for a week’s electric, my stay averaged $10 per night for full hookups! It was a really neat park and I enjoyed my stay. They had live music twice during my stay, a country band on Thursday and a 60’s/70’s band on Saturday night. The sites were huge. They are all individually owned and they rent them out when the owners are away. Most of the lots had a little building on them. 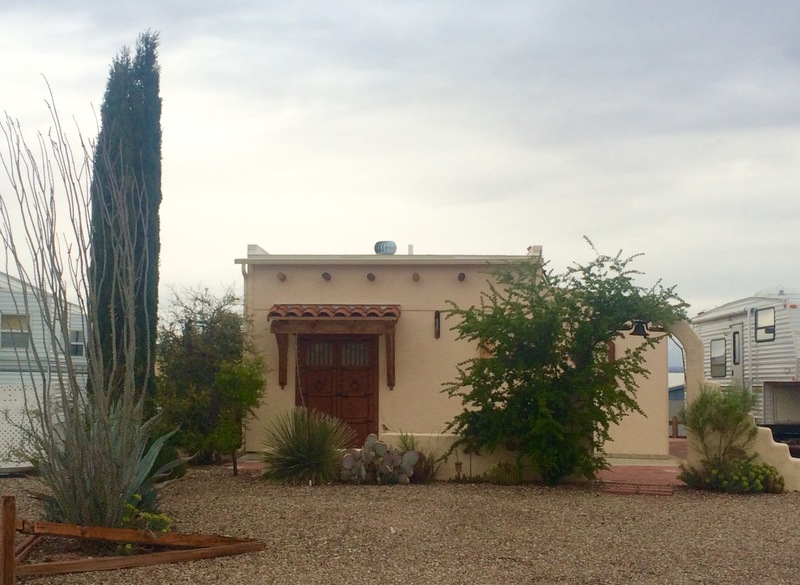 Some were barely more than storage sheds but many were very fancy casitas like this one. The residents were incredibly friendly. My arm got quite a workout from waiving and everywhere I went I ended up having a conversation with a resident. My first stop and the primary reason for my visit: Tombstone, the site of the shootout at the OK Corral and many, many more gunfights. I got there on a weekday morning before all the shops were open and walked the streets reading every sign, most of which related who shot whom where. 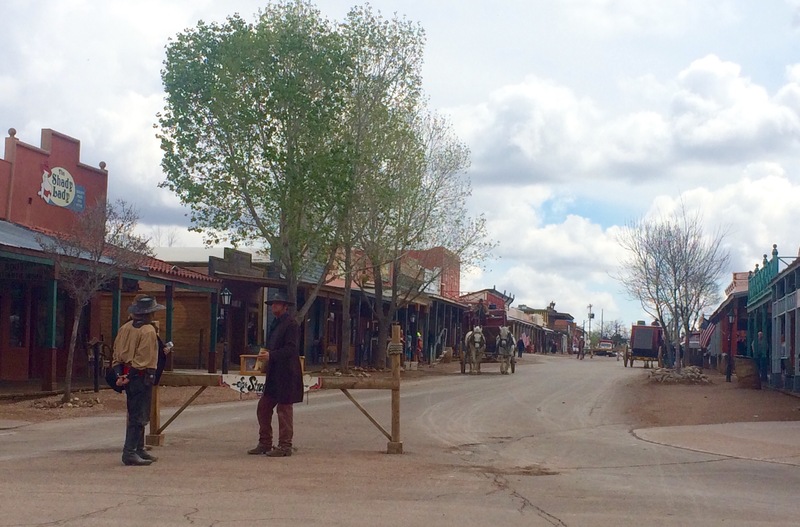 The town has several actors dressed up in period costumes that roam the streets and I presume put on the gunfight shows that I didn’t bother to see. Next, I went to the Tombstone Courthouse State Historic Sight. It is a beautiful old building and a very informative and entertaining museum of the town’s history and more reasonably priced than the many commercially operated museums in town. 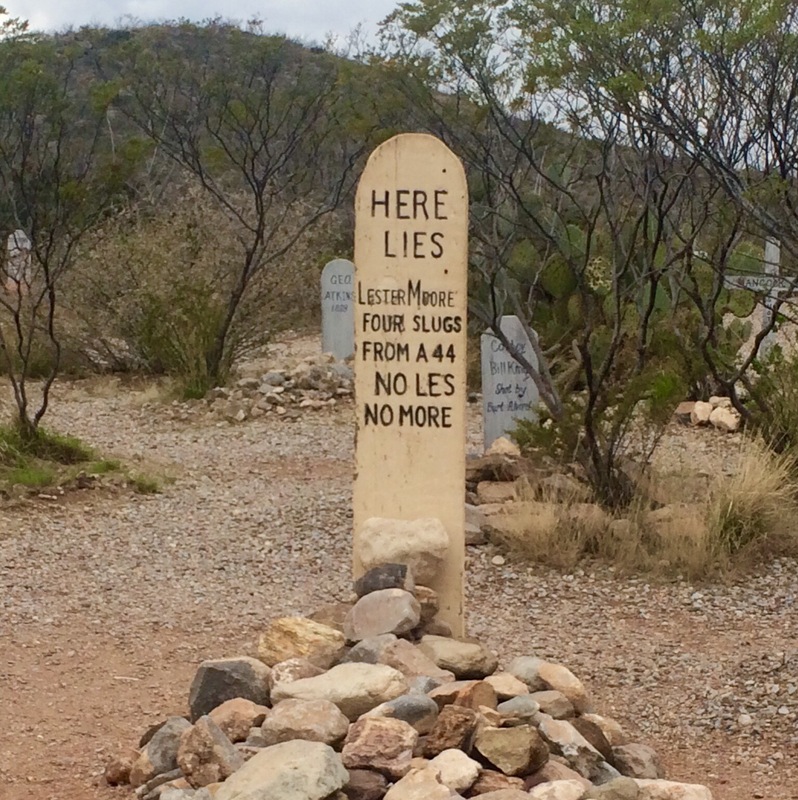 Finally, I visited Tombstone’s rather famous and colorful cemetery. This cemetery only served Tombstone for 6 years in the 1880’s. I asked where their next cemetery was and was directed to a much larger cemetery at the west end of Allen Street. I didn’t find any graves from the 1890’s as I’d hoped. Most likely because the markers were wood and had rotted and no one had bothered to try and preserve their names as they did in the older cemetery. But it was still a very interesting place and worth a visit. 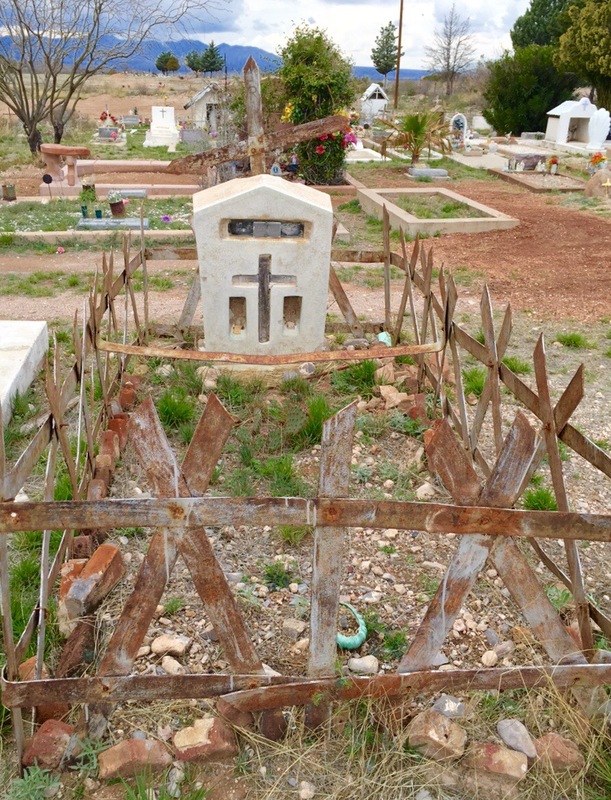 The oddest thing about this cemetery was that the markers were so varied and unusual. Not a whole bunch of similar looking headstones here. People decorated their loved one’s graves with everything from homemade concrete tombstones to colorful bottles to iron artwork. Here are pics from each cemetery, the old one on the left and the “new” one on the right. Bisbee is a cool little Arizona town not far from the Mexican border that I spent one day exploring. It is known for its many steps as the whole town is built on hillsides. I wasn’t sure how much exploring I could do as stairs are my knees kryptonite but thankfully along with the stairs were plenty of sloping sidewalks and lightly traveled streets. So I got around pretty well and walked several miles around the town. 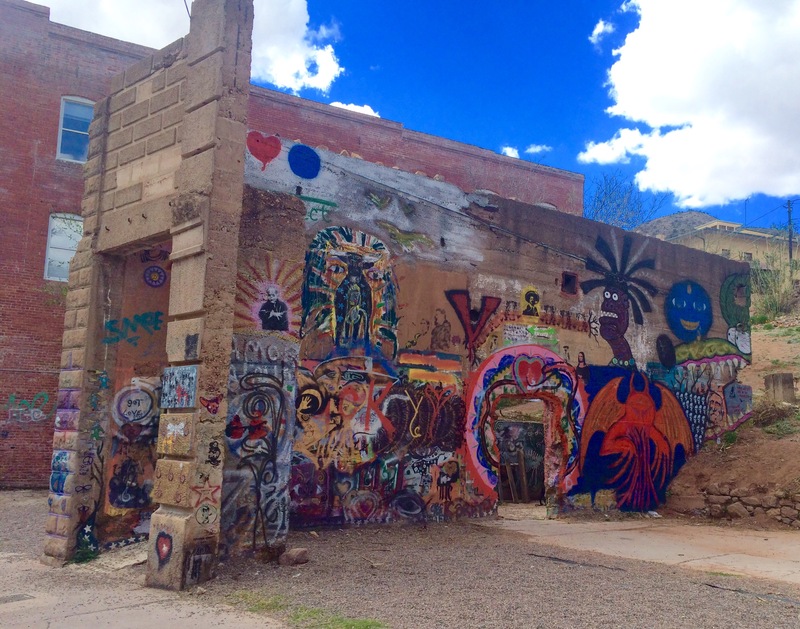 One of my favorite things in Bisbee was that instead of tearing down parts of old buildings that remained they turned them in to art. 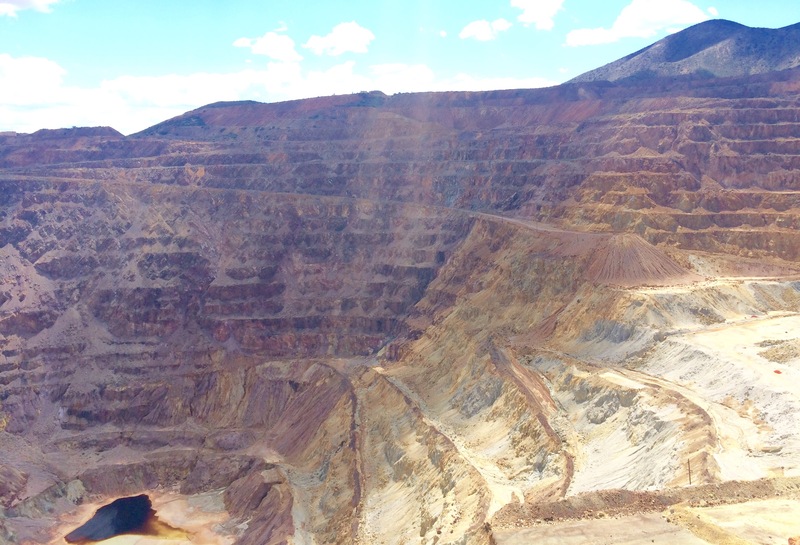 The huge mine pictured below is right in the middle of the town. 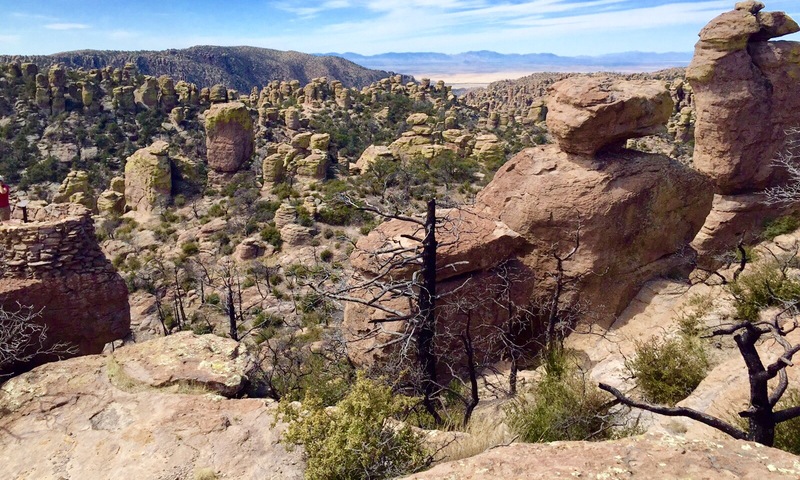 The Chiricahua National Monument was the farthest foray I made on another of my 7 days in the area. It was an hour and a half from camp but well worth the trip. When you reach the top of a scenic drive there are thousands of hoodoos everywhere you look. It seems impossible that most are standing. There are many excellent hiking trails here. I was tuckered out after hiking 4 miles so I headed for home only to realize that Fort Bowie was nearby. I had read about it and wanted to visit. The sign said you had to hike 3 miles round trip to see it. I wasn’t likely to make it back this way again for a long time so I dug down deep and found a second wind and off I went. Luckily it was easy terrain and worth the exertion. 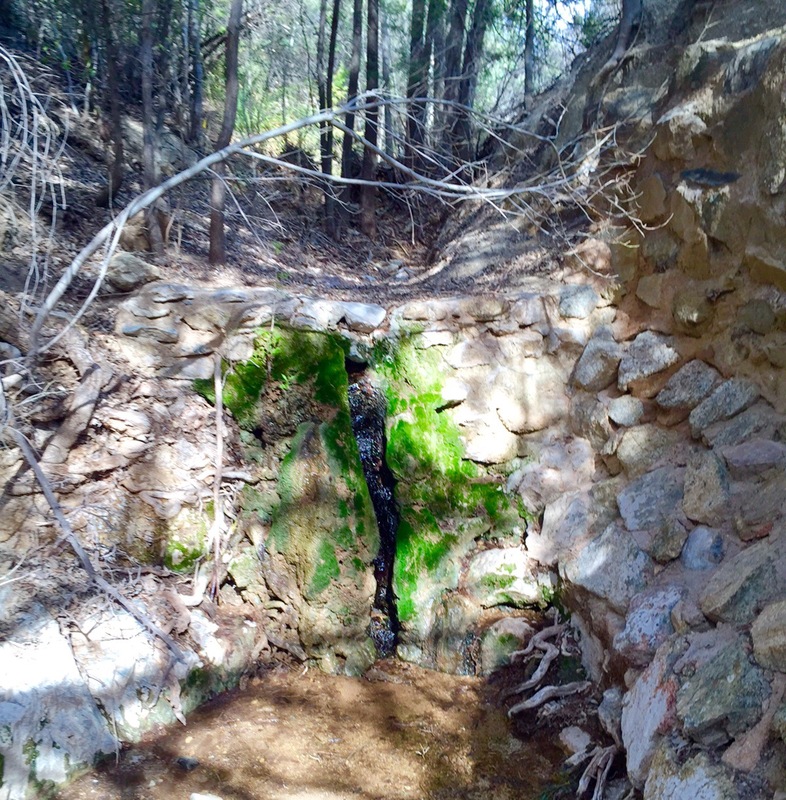 Here is the Apache Spring. It is the reason for the fort and the cause of many battles over this land, the only reliable water source for many miles around back in the day. I’m not sure it is too reliable now. Unfortunately by the time I got to the substantial ruins of the fort my mind was already on the hike back and I failed to take any pictures. If you are in the area it is worth a visit.